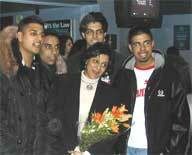 Actor, author and writer for screen and stage Meera Syal dropped into Ealing Film Festival last week (28/01/2004) following a screening of the film Anita and Me. The film, for which Meera wrote the screenplay, is based on her autobiographical novel of the same name which details her life growing up in the midlands as an Asian teenager in the 1970's. Multi-talented Meera is most well known for her role as Granny Kumar in the hit BBC TV series 'The Kumars at No 42'. She had previously stared in the hit series 'Goodness Gracious Me' and has also written the story for the west end musical 'Bollywood Dreams', which is about to open on Broadway in New York. Meera took questions from the audience and also festival director Beth Copley. Meera spoke to an the audience about her experience of being an Asian woman working in the media, what had inspired her and also her pride in breaking new ground with her comedy work. After the question and answer session Meera spoke to her fans individually, signing autographs and even recording an answer phone message on a mobile phone for one fan. After meeting Meera one fan commented 'Not only is she a great role model for Asian women she is also a very genuine person'.